Hiring a limo in Luton has never been easier. Crystal Chauffeurs makes the entire process of hiring your limo a piece of cake. All you have to do is list your limo hire Luton needs and let us take care of the rest. Do you need a limo hire for wedding transportation? Do you want to impress your VIP guests? Do you need a reliable airport transfer service? Any big event of yours can be made extra special when you hire a limo for your transportation. We are the most experienced Executive Limo Wedding Car Hire Luton, and we have a long list of very happy and satisfied customers that vouch for the quality of all of our services. We have the biggest and best fleet of vehicles available for hire including the Millennium Limo, Hummer H2 Limo, Ferrari Limo, Mini Cooper S Limo, and various other limos available in different colours such as pink, blue, black and white depending on your preference. 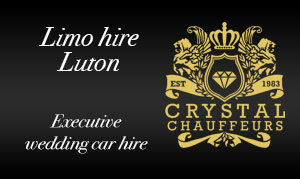 You will not have any problems in finding the perfect limo hire Luton with Crystal Chauffeurs. If you are unsure which limo best suits your needs, then it is no problem for you to get in touch and discuss with us your needs and specifications. Leave it to us professionals to recommend the perfect limo to make your big day extra special. Every single customer that comes to us with their Limo hire Luton needs has a different idea of what they want their special day to be like. No two orders are ever the same, but we can accommodate to this with our customisable packages. You will only be paying for what you get, and will not be roped into a pricy package that includes things that you don’t use nor want. Unlike some of the Executive Limo Hire Luton services, we aim to give our customers the most unique experience. Our prices are low but the standard of our services are top class. All of our vehicles are well maintained and regularly serviced before they are sent out to our customers. You can be assured that you wont run into any issues with the vehicle on your big day. As well as providing the best vehicles, we also send you an experienced chauffeur to accompany your luxury limousine. All of our chauffeurs are pre-screened, fully licensed and trained in people skills, they are very polite and ready to go out of their way to make your experience the best it can be. Crystal Chauffeurs ensure to not only succeed in customer satisfaction, but to exceed customer expectations. Our tailored customer packages are unlike any others in the executive car hire Luton area, all of our vehicles are tastefully furnished to making you feel like royalty. We guarantee our customers 100% satisfaction, so do not hesitate to get in touch with us for a free quote on all your personalised needs. There will be no added on costs, the quote you receive will be all inclusive. Choose Crystal Chauffeurs for all your limo hire needs.